New for 2019 and by popular demand, a set of 4 tastings where we explore the wonderful world of wine in greater depth. Our WSET Level 2 students often tell us they would like more tasting experience. These tastings are not only for them, but also for anyone who wants to know more about wine. We start off in France because French wine labels don’t usually show the grape varieties, so we often feel less confident about what will be in the bottle. Focussing on the major French wine rivers, we find out about the history of each area, how the rivers influence the wines, and how the wines have evolved into the iconic styles we know today. So hop into your kayak and come wine river exploring with us! Your tour guide will be Diana Lyalle DipWSET, who is one of our WSET course tutors. Please call the shop on 01934 708312 to book and make payment. Thursday 21stMarch £20pp – We start our French wine river tour in Bordeaux and South West France, where we explore the beautiful rivers Dordogne and Garonne which then join to become the famous Gironde which flows into the Atlantic. We discover the history of these illustrious wine regions and examine the influence of the rivers upon the wines of the area. Thursday 23rd May £20pp – Our French wine river journey continues into the land of chateaux – the beautiful Loire valley. The climate along this long river changes as it flows ever closer to the Atlantic Ocean, so we examine how the wines made beside the river reflect its journey to the sea, and how climate change affects the style of Loire valley wines we will be tasting in future years. Thursday 11th July £20pp – Our third week of French wine river discovery covers the Rhin, which flows parallel to the Alsace region, and the Saône, which flows alongside the Burgundy appellations of Chalonnaise, Maconnais and Beaujolais. We find out the history of these classic wine producing areas, and why they grow the grape varieties they do. 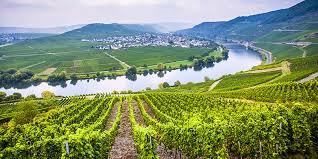 Thursday 17thOctober £20pp – Our final French wine river journey covers the mighty Rhône valley. The wines from the North are very different to those from the South, so we explore the fascinating history of these regions, the influence of the river itself on the styles of wines made beside it, and reflect on how the changing climate and other factors affect the style of wines we can expect from the Rhône in the future.